MANILA -- In a democracy like the Philippines, people select leaders through the process of elections. As stated in Article V, Section 1 of the 1987 Constitution, every Filipino at least 18 years old has the right to suffrage. This covers all Filipinos, including those abroad, as well as the disabled and illiterate as the State cannot impose literacy, property, or other substantive requirement on the exercise of this right. 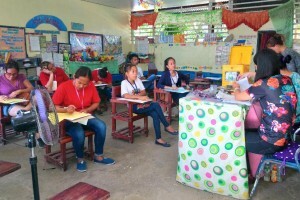 On May 13, a total of 61,843,771 registered voters will head to polling centers to vote for national and local posts. Based on Commission on Elections (Comelec) data, Region 4 -A or Calabarzon (Cavite, Laguna, Batangas, Rizal, and Quezon) has the most number of voters with 8,674,351, followed by National Capital Region (NCR) with 7,074,603 and Region 3 (Central Luzon) with 6,829,661. -Region 7 (Central Visayas) -- 4,946,353. -Bangsamoro Autonomous Region in Muslim Mindanao (BARMM) -- 2,172,959. Latest figure from the poll body showed that as of March 19, it has printed a total of 38,347,754 ballots, representing 60.24 percent of the total number of ballots to be used in the forthcoming polls. The printing of the ballots started last February 9 and is expected to finish several days earlier from its target completion date which is on April 25. National positions, which are up for grabs in this year’s mid-term elections, are Senator (12) and Party-list group. Meanwhile, local positions include member of the House of Representatives; Governor; Vice Governor; member, Provincial Board; City/Municipal Mayor; City/Municipal Vice-Mayor and member, City/Municipal Council. On Election Day, voting starts at 6 a.m. up to 6 p.m. Once the voter is inside the schools premises, he/she should look for his/her precinct number and sequence number posted outside the polling place where he/she is assigned. The voter will then approach the Electoral Board (EB), and tell the latter his/her name, precinct and sequence number to verify his/her identification using the Election Day Computerized Voter’s List (EDCVL) or through Voter Registration Verification Machine (VRVM) in some areas. The selected areas that will be using VRVM are Manila, Quezon City, Caloocan City, Cavite, Pangasinan, Nueva Ecija, Cebu, Iloilo, Negros Occidental, Misamis Oriental, Davao del Sur, Zamboanga del Sur, and BARMM. In areas that will be using the electronic verification, a voter will put his/her finger (index or thumb) in the machine’s scanner. If the voter has a record in the system, his/her picture and other details will appear on the screen. The EB will then push the “VERIFY” button and the machine will issue a verification receipt. The voter will give it to the EB, and the latter will give him an official ballot. The voter is reminded to make sure that the ballot is clean without any markings. If, otherwise, he/she should not accept it. Once, he/she receives the ballot together a ballot secrecy folder and marking pen, the voter may proceed and cast his/her vote, by shading the oval opposite the name of the candidates, he/she has chosen. The public is reminded to shade at least 25 percent of the oval, which is accepted by the VCM. Voters are likewise reminded not to overvote as their vote will be considered stray since the machine will not count any ballot with overvoted position. However, the people are allowed to abstain for positions where they can only vote for one candidate or undervote or vote less than the required number of candidates allowed for the position. After voting, the voter will personally insert the ballot into the VCM, he/she must wait for a second as the machine will issue a receipt. The Board Chairman will then put an indelible ink on the voter’s index finger. He/she then drop the receipt into the box and exit the polling center. If after 6 p.m. and there are still voters within the 30 meters radius of the polling place, who have yet to cast their vote, the voting shall continue to allow them to cast their votes without interruption. The poll clerk shall, without delay, list the names of said voters. The voters listed shall be called to vote by the clerk by announcing each name three times in the order in which they are listed.